Jody Levett is pleased with the progress his Worthing Raiders squad are making following their opening four National 2 South matches this season – despite suffering late heartache as they fell to a second defeat in succession on Saturday. Redruth scored a try with the last play of the match to edge to a one-point 20-19 victory over Raiders at The Recreation Ground. George Harris went over four minutes from the end to hand Levett’s side the lead for the first time, only for them to be denied a first-ever win at Redruth in the closing seconds. Despite the defeat, Raiders head coach Levett has been pleased with the progress his side have made in the early stages of the new campaign. He said: “Being so close to winning and not able to see the game out does make it frustrating. However, there were a huge number of positives to take from the game. Although pleased with some positive progress made so far this season, Levett knows his side must be more clinical and see matches out if they are to finish where they want to be come the end of the campaign. With several of Raiders’ recruits over the summer making the step into National 2 South for the first time this season, Levett is aware long away trips will be something his team must adapt to and said: “We’re still a relatively new group of players, which we are adding to all the time. Coming off back-to-back defeats, having won their opening two matches, Raiders face the current top three in their next three matches. 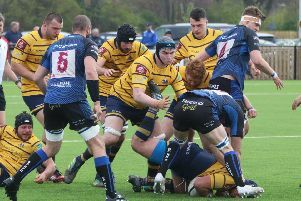 A daunting run starts with third-placed Chinnor travelling to Roundstone Lane on Saturday, before a trip to Taunton Titans - in second - then a home match against leaders Cinderford a week later. Levett hopes his side can spring a surprise in one or more of the games.